The last day of diving on this trip had only two dives. A storm was moving in so the seas were getting kicked up and the wind was blowing enough to make the 65° air feel cold (it’s amazing how fast you acclimatize to warmer temperatures). Getting in the water didn’t help, it also felt cold, but there was enough stuff to look at on the first dive to distract from the chill. There were two lobsters that were happily waving their antennae around. I assumed it was a defensive measure, but they were doing it when there didn’t seem to be anything to defend against. Perhaps they were both nervous about finding themselves trying to hide under rocks that were clearly too small. Under a much larger rock, not too far away, a large crab was hanging out with plenty of room to conceal itself. 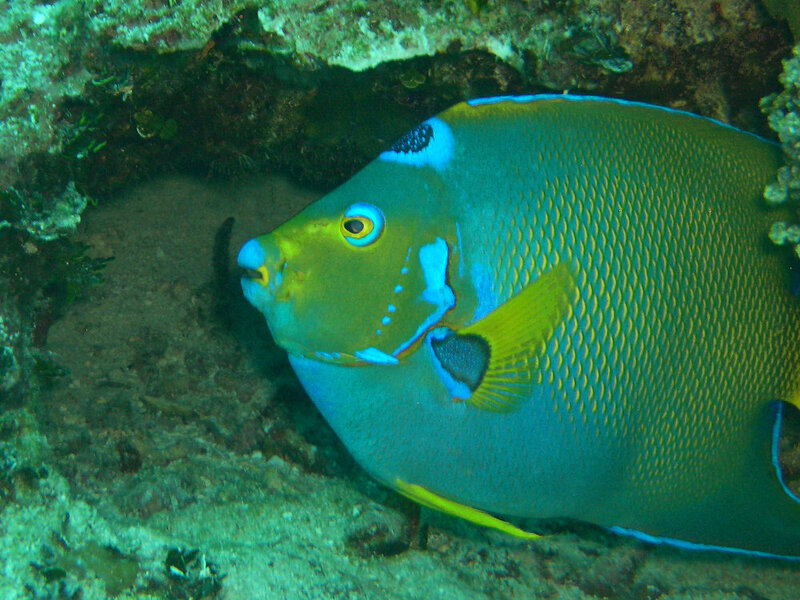 The highlight of the dive, however, was the queen angelfish at the cleaning station. 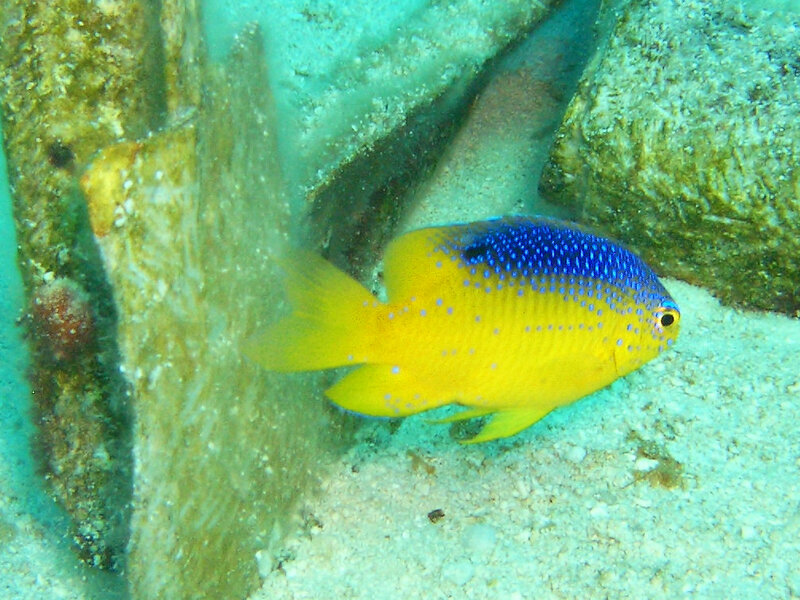 The iridescent blue of these fish almost forces me to take pictures of them, but the photos never turn out as vibrant as they appear on the reef. On the second dive, it was quickly apparent that the storm was starting to churn up the water as well. There was more dirt and sand in the water than we had seen on most of our other dives and the visibility was dropping rapidly. The boat was anchored 15-20′ from the reef and when we got to the anchor, it was difficult to make out exactly where the reef was. 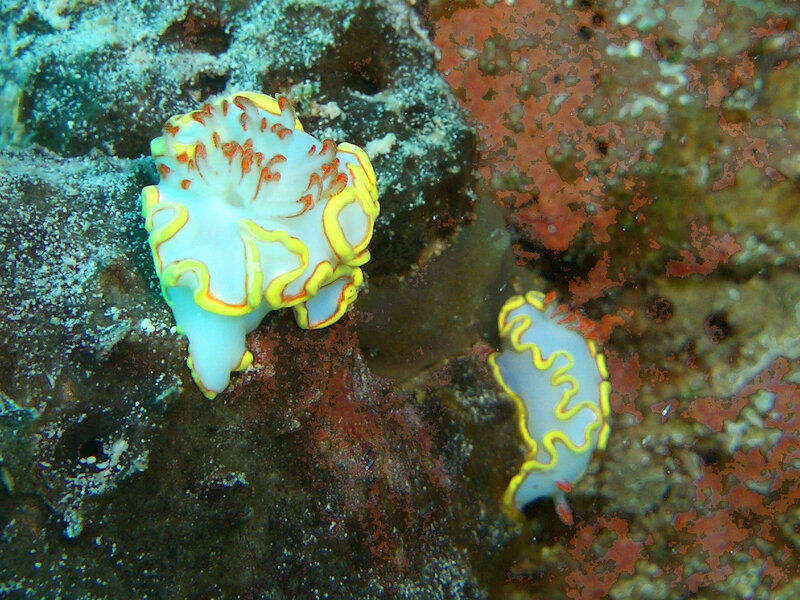 There were even more spaghetti worms on this reef and several flamingo tongues. Swimming around on top, there were dozens of Bluehead Wrasse. It was a nice enough dive, but certainly nothing exciting to see. Still cold from the earlier dive, I chilled to the point of shivering and decided it was time to end the dive. We found several sea stars in the sand as we followed the anchor line back to the boat. That night, after we pulled into port, most of the passengers and crew went out to a local bar for some drinks. I got to try my third brand of Bahamian beer, High Rock, having already tried Kalik and Sands. We spent one more night on the boat in port and then disembarked for the final time. With several hours before our flight, we toured the John Watlings Distillery. The funny thing about this distillery tour was that there wasn’t a still and no one on staff seemed to have any idea where it was. Finally, the last member of staff I could ask knew that the rum was distilled off-site currently, but the still would be moving on-site within the next year. We had a wonderful time and, despite the coral die-off, the diving was good. It was wonderful to get back into the water. In fact, it is encouraging me to look into diving some of the geothermally heated lakes around Idaho (still don’t want to do cold water diving). It was great to meet all the other divers on the boat and it would be fun to go diving with all of them again. Now that we’re home, it must be time to start planning for the next adventure. Any suggestions on where we should visit? 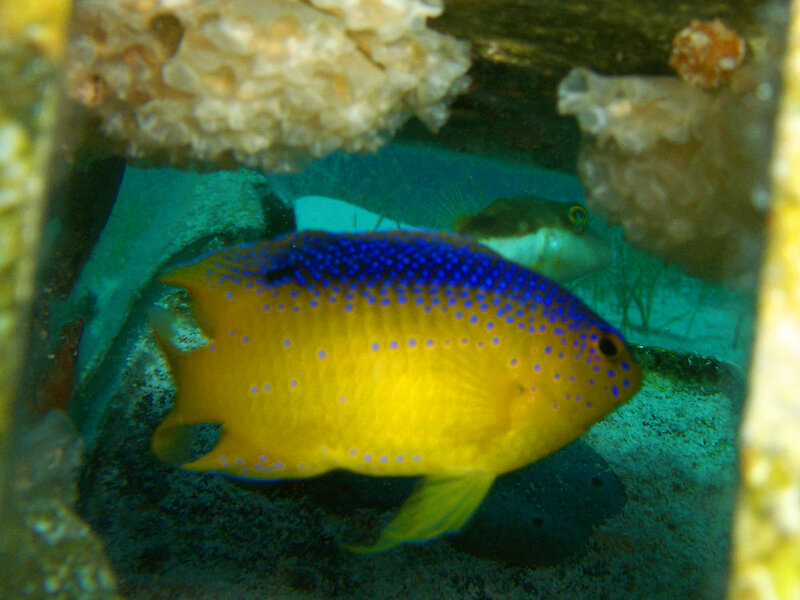 This entry was posted in Travel and tagged Bahamas, diving, photography, scuba. Bookmark the permalink. Reblogged this on Down with the Sea. As to your final line.. I suggest a visit to Western Australia to see your tall friend there!! I love the Bahamas.. lived between a few of the islands years ago working on a yacht as a stewardess. That sounds like a great option! Plus I hear there’s some sailor/pirate in that area I need to meet. When there's a dragon in your town, you must say hi. Follow up on yesterday's post. The spigot has now been replaced and water is only coming out when (and where) it's supposed to. The pictures of the crawlspace where the work happened were to dark to share. Any plumbing experts out there? I think the split is a problem, but want a second opinion.